What Type of an Ecosystem Does an Anaconda Live In? What Eats a Snake in the Rainforest? Most people become confused when they try to identify the differences between boas, pythons and anaconda snakes, even though anacondas are a subset of boa snakes. They all are cold-blooded, carnivorous and swallow their food whole, but despite similarities, each snake has its own distinguishing traits. The name “boa” means “large serpent” in Latin. They are categorized in the class Reptilia, order Squamata. Growing up to 30 feet and 280 pounds, the boa inhabits moist, wooded and grassy environments throughout North and Central America, Africa, Asia, Madagascar and the Pacific Islands. There are approximately 41 species of boa, with the rubber boa (Charina bottae) and rosy boa (Lichanura trivirgata) being the only species indigenous to the United States. The boa constrictor also is a species of boa, however, “constrictor" also describes the general predatory habits of boas as a whole. After striking prey with their fangs, boas encircle their bodies around their victims, squeezing them to death by suffocation. Pythons are distributed throughout Asia, Australia, Madagascar and Africa. They live in moist, green habitats such as savannas, rain forests, swamps and grasslands. There are33 species of python which weigh up to 250 pounds and grow up to 33 feet. Pythons are non-venomous, and like boas, they coil their bodies around their prey, killing them by asphyxia. Pythons also are grouped in the class Reptilia, order Squamata. Also called “water boas,” anacondas inhabit the wetlands and rain forests of South America. There are four species of anaconda. The green anaconda (Eunectes murinus) is the largest snake in the world. Anacondas weigh up to 550 pounds, have a diameter of up to 12 inches and grow up to 30 feet long. Like pythons and boas, anacondas are also predatory constrictors, and are categorized in the class Reptilia, order Squamata. 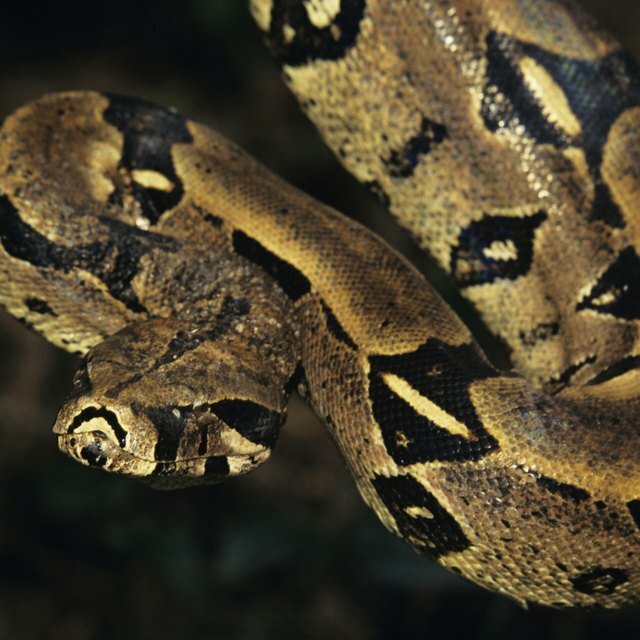 Even though boas, pythons and anacondas share the same biological class and order; they differ in family classification. Boas and anacondas belong to the family Boidae; anacondas are actually a species of boa. Most classifications categorize pythons in the family Pythonidae; while a few list them in the family Boidae and subfamily Pythonidae. So for practical purpose, boas represent a group of snakes; anacondas are a type of boa within that group; and pythons are a closely-related but different kind of snake. Boas, pythons and anacondas are meat eaters that feed off a wide range of animals including birds, rabbits, rodents, wild pigs and turtles. However, possibly because anacondas have a much larger girth than boas and pythons, anacondas also eat larger prey including jaguars. 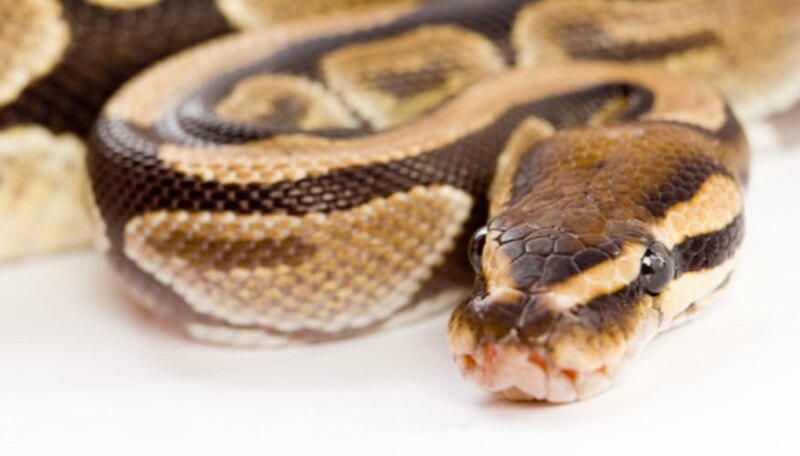 Boas and pythons live up to 35 years; whereas anacondas live up to 10 years. Boas, pythons and anacondas all live around and swim in water, but anacondas spend a larger percent of their life in the water itself. Also, pythons lay eggs while boas and anaconda give birth to live newborns. Sigust, Andrea. "Differences Between a Boa, Python, & Anaconda." Sciencing, https://sciencing.com/differences-between-boa-python-anaconda-8351539.html. 10 April 2018. Which Reptiles Do Not Lay Eggs?